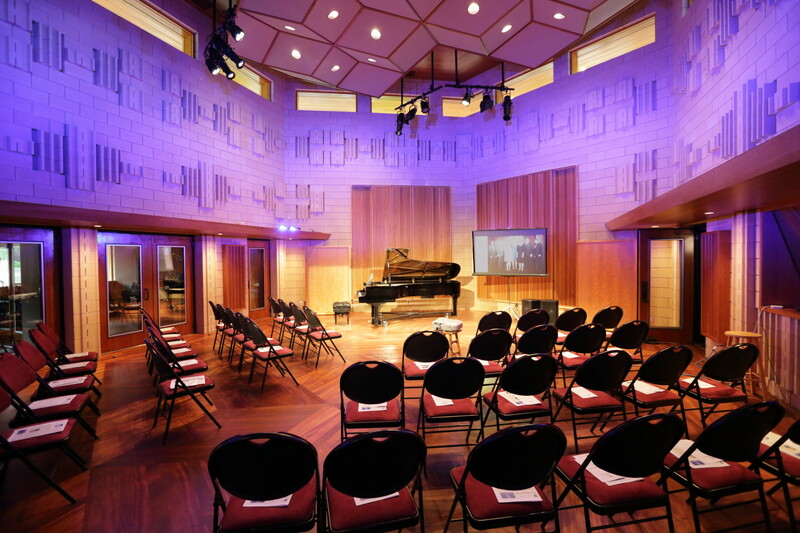 We are proud and fortunate to have created the inspiring space that is Manifold Recording. But we always envisioned achieving something more than what we can do for artists, engineers, and producers. We believe that there is a larger public sphere that is curious, excited, and even ravenous for new ideas, new experiences, new musical performances and productions. We wanted to also create a space in which a newly-engaged public could bring new energy, new interests, and new resources to create a healthier, more vibrant, more sustainable future for music and musicians. One thing I have learned as a former Trustee of a model Montessori school is the importance of the prepared environment. Characteristics of the prepared environment include: beauty, order, reality, simplicity and accessibility. It may have required the genius of Maria Montessori to explain why these are crucial to child development (compared with, say, efficiency, authority, policy, technology, and convenience), but as adults, it is obvious to most of us that such environments are conducive to our own development, too! Like fertile ground ready to bring forth an abundant harvest of whatever may be planted, prepared environments known as Salons helped bring about The Enlightenment by injecting academic discussion and debate into a newly formed public sphere (that was also a by-product of the Salon experience). Adam Smith and Benjamin Franklin presented and refined their ideas at salons, “inventing” large parts of modern capitalism and modern democracy in the process. But commerce and politics were not the exclusive subjects of salons–they were but two of myriad subjects that excited those who participated. Frédéric Chopin and Franz Liszt were proof of that. 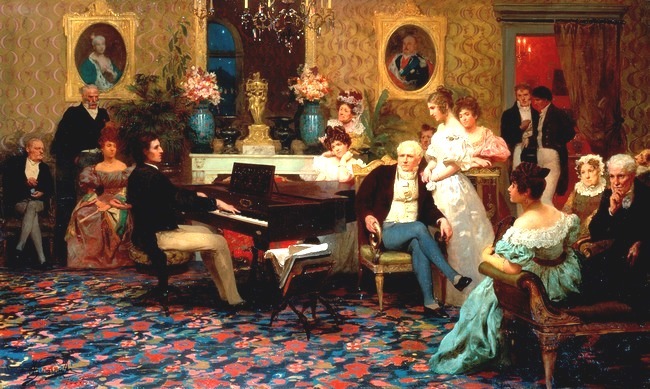 Chopin, in fact, preferred the environment of the salon to public performances. Back when Chopin and Liszt played their instruments, there were no amplification systems. Concert halls were typically built with every consideration being given to the patrons and their entourages; acoustics were typically an afterthought, albeit sometimes a costly one when the most expedient way to improve them was to tear down the hall and start over again. Technology and science have advanced tremendously since the early 19th century, and despite Glenn Gould’s predictions to the contrary, performers like Lang Lang and Joshua Bell are filling concert halls everywhere they go. But it is perhaps because of the spectacle and grandeur of the concert hall performance that artists and audiences alike continue to seek more human-scaled musical experiences. Not one to the exclusion of another, but a restoration of the balance between the sheer awe and wonder of a great symphony orchestra and the immediacy of a solo or a small-group performance. In many ways, the Internet has stepped forward as a technological substitute for the salon. It is possible to become a fly on the wall of almost anything anybody is willing to recording in their living rooms. But in terms of curated experiences (which the salons were), TED talks function most like a digital salon, inviting the most prominent thought-leaders to talk for 18 minutes about “ideas worth spreading”. The development and spreading of ideas was very much a goal of the 18th and 19th century salons. Continuing the analogy, if you have ever seen a TED talk, you cannot help but notice that there are people in the audience. The pattern of the original salon lives on, albeit with a transmission technology that gives millions of people a chance to see a glimpse of what previously only dozens of people may have been privy to. NPR now produces TED Radio Hour, an auditory salon that forces the discussion away from PowerPoint slides or other graphic materials, and forces the speakers (or the pre-recorded talks) to address ideas that can only be spoken about–not viewed. It is an interesting experiment, and one which, with the right listening environment, could be a great platform for bringing more different kinds of music to more people by way of the ideas of music. But what about the experience of music? The experience of artist, instrument, and music in an environment rich with resonance and ambiance? An environment in which time actually means something, because can be heard at one place at one time is the truth unique to that place and that time? There is a lot of information that can be conveyed via streaming audio or streaming video, but the experience of participation, the effects of participation are something altogether different. 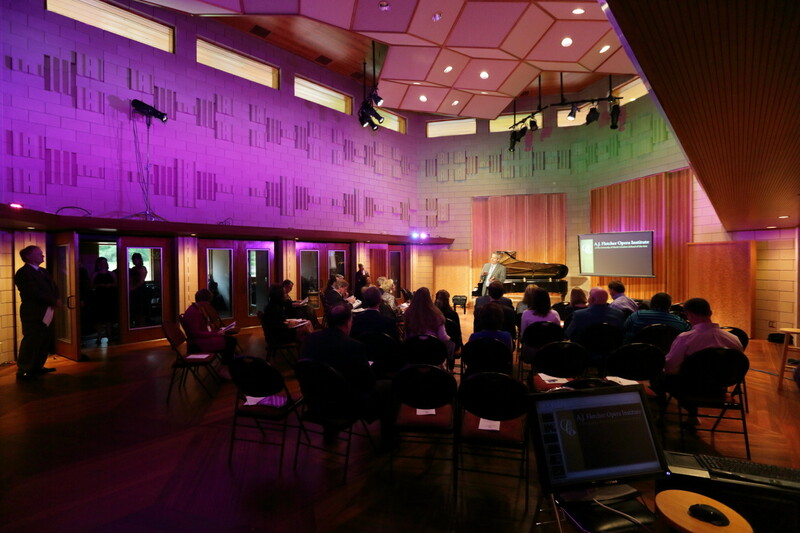 We have hosted a number of events that have attempted to give people access to or the experience of the music recording process. Béla Fleck and Brooklyn Rider hosted a salon that gave us a glimpse into a new work for classical banjo and string quartet, which will be released shortly as Night Flight Over Water on the upcoming album The Imposter. Matt Phillips invited friends and family to join his band as backup singers for a song on his soon-to-be-released album Move (I will update the link when it is released). This involved him teaching the participants the parts, rehearsing, and the recording the results (which sounded wonderful). Frederic Chiu was the first artist to use Ustream at the studio to deliver real-time content to a web audience. Jimmy Herring did a series of master-class lessons and dove into the technical details of his guitars and amplifiers, spreading many great ideas in the process. John Heitzenrater hosted a musical salon explaining Hindugrass–the marriage of Appalachian folk music with classical Indian ragas. But we have only just scratched the surface. To the right you can see Wade Weast, Dean of the School of Music at UNC School of the Arts, talking about Opera and helping the audience to understand the nuts and bolts of finding, sponsoring, developing, and sustaining the next generation of great opera singers. While that subject may deserve a 20 minute talk on public radio, the sheer joy and excitement created by monumental operatic talent is a far more compelling story, and that story is best told by a great operatic singer, singing in a great acoustic environment. When that happens, supporting the institution of opera becomes a simple matter. And when one has the opportunity to speak directly with the artists, one can become directly and unequivocally aware of what ideas and initiatives might have the greatest impact. Are you interested in joining a salon in the future, either in person or via an online stream? Please subscribe to our newsletter (via our home page) so that we can keep you up to date with our schedule. Are you interested in hosting a salon in the future? Please let us know! By bringing the right people together in the right environment, amazing things are sure to result. You may even find that you can be the change you want to see in the world!